To say I am a fan, would be an understatement. Those who know me, know the impact Devdutt Pattanaik’s work has had on my life. I started following his work reading the weekly articles in Sunday Mid-day and moved to reading his blog and gradually to reading his books. His Myth=Mithya & Jaya are my absolute favourites! They unfold an extremely magical world of Indian mythology! In a small interview with management coach, doctor, artist, writer and an awesome story-teller – Dr Devdutt Pattanaik! When did your love for decoding symbols start? Roughly 20 years ago, after medical college. It was something I did as a hobby and saw how much people enjoyed it. Over 25 books and a wide range of readers from young to old; how do you pick a subject to write on which will also strike a chord with such a varied audience? I love the subject; so I primarily write for my own pleasure. It feels good that others enjoy it too. India is a land of vast wisdom but very little of it actually reaches the masses. What reaches the masses is rather ponderous and serious and honestly, quite boring, for me. Jaya is a compilation of various perspectives of the Mahabharata. Traditional and folk. Do you think folk myths evolve from traditional myths or is it vice-versa? I am convinced that stories begin at the bottom, in villages, in local tongues, and gradually reaches up to the elite, who codify it in written form. Since we value the written over the oral, we assume the elite are the source of Indian wisdom and that classical wisdom is all Sanskrit. Your latest book, Business Sutra, connects two extremely different verticals together – business and myths. How difficult was it identifying relevant myths to explain each concept? It was very clear and simple to me. The difficulty is reaching out to the reader, for most people don’t know mythology but have many assumptions about it, and very few people really understand management enough to see its Western bias. So I am battling with what people ‘don’t know they don’t know’. We are seeing a radical shift in people’s preference of mythological characters. It’s no longer Ram or the Pandavas. It is now Karna, Krishna, Shiva and even Ravana for some people – the eternal rule breakers of Indian Mythology. Why do you think this shift is happening? Its not really a shift. The former was thrust down people’s throats, the latter is people’s choices as they identify more with imperfection and characters who (they see) as rule-breakers, revolutionaries and cool dudes. More often than not, they are projecting their own assumptions and very little is based on understanding of the characters themselves. For Ram and Krishna are both Vishnu and Vishnu and Shiva are expressing similar ideas in different ways, so the differences are more superficial than real. But very few get that. We prefer the cosmetic. I am a regular reader of your works and I have often come across this phrase “Shiva to Shankara” describing the ascetic Shiva becoming the worldly Shankara. So, when the halahal comes out of Samudra Manthan, is it the indifferent Shiva who is drinking the poison or is it the worldly Shankara? 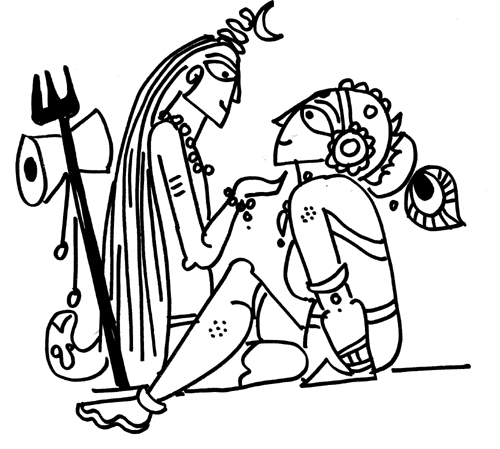 Shiva drinks it, and Parvati stops the poison in his throat from going down, and reminds him he is Shankara. People (Devas) have to clean up their own mess (Halahal), she says, if they want rewards (Amrita), not the guileless Shiva. She makes a householder of him. Who is your favourite character from Indian & world mythology and why? I like them all. They are pieces of a grand and complex jigsaw puzzle, if you focus on one you lose the big picture. Ramayana, in the same style as Jaya. Coming by end of 2014. Devdutt Pattanaik has written over twenty-five books and 400 articles on Indian mythology for everyone from adults to children. Since 2007, he has been explaining the relationship between mythology and management through his column in the Economic Times; the talk he gave at the TED India conference in 2009; and the show Business Sutra which ran successfully on CNBC-TV18 in 2010, besides numerous other lectures at Indian universities and management institutes. Trained to be a doctor, he spent fifteen years in the healthcare (Apollo Health Street) and pharmaceutical (Sanofi Aventis) industries and worked briefly with Ernst & Young as a business adviser before he turned his passion into a vocation and joined the think tank of the Future Group as its Chief Belief Officer. this is call dreams coming true! rather say, pursuit of happiness. very happy V.